Italian politics is in the midst of an unprecedented trial of ideological mixing. Last March, the Italian general election produced no definitive majority, marking a substantial shift away from dominance of establishment parties. Former Prime Minister Matteo Renzi’s Democratic Party was ushered out in favour of a coalition consisting of Matteo Salvini’s Lega and Luigi Di Maio Movimento 5 Stelle (M5S), both of which ran on openly populist platforms. The M5S gained considerable traction in economically deprived regions of Southern Italy, promising broadened social security programs such as a guaranteed income. Regardless of the many hallmarks M5S has of a traditional leftist party, including advocating for improved labour rights, a rapid shift away from fossil fuels and the priority of social services over privatization, it does not pass the socialist litmus test on other matters. In the past, the party has been accused of promoting xenophobia and of supporting anti-immigrant policies, often violating immigration standards set by the EU. The other half of the coalition is led by deputy Premier Salvini, whose party ran on a platform of fiscal conservatism, promising the imposition of a flat-tax, and nativism, calling for stronger borders and less immigration. The ideological hodgepodge currently controlling Italian politics was founded on the promise of largely contradictory economic and social policies, which are now materializing into an incongruous fiscal budget. The Italian government’s 2019 budget includes Salvini’s prized flat-tax, reverses 2011 legislation increasing the retirement age, and creates a ‘guaranteed income’ for Italy’s poorest. The result is a 2.4% deficit. While increased government spending is welcomed by many Italians who have been suffering from sluggish growth rates since the European sovereign debt crisis (Italy’s per capita income has still not recovered to pre-crisis levels), initial analysis marks the proposed budget as addressing only the surface level of Italy’s economic woes. Five million Italians currently live in absolute poverty and while the €10B in spending on citizen’s income will be helpful for many, it will do nothing to remedy Italy’s poorly planned welfare apparatus. Such shoddily designed programs compounded by Salvini’s flat-tax only stand to weaken Italy’s fiscal condition. All the while, EU institutions have not been deaf to the qualms of Italy’s new dynamic duo. The populist parties now in power were explicit in their intent to work contrary to policies made in Brussels. Both promised to shield Italy’s sovereignty from EU integration, and they have certainly fulfilled that promise. Italy’s proposed 2.4% deficit runs contrary to the informal agreement of keeping deficit spending below the 1.6% and jeopardizes the mid-term structural deficit limit of 0.5% for countries exceeding a debt/GDP ratio of over 60% (Italy’s is currently 131%). Moreover, the already exorbitant deficit may potentially increase, as the budget is subject to alteration when passing through the Italian parliament. In the case that the final figures create a 3% deficit, violating EU limits on fiscal spending, a serious clash between Rome and Brussels can be expected, as this would meet the constitutionally enshrined threshold. Fiscal spending is not the only matter the Italian government has chosen to antagonize the European Union with. Spearheaded by the chauvinism of la Lega, Italy has proposed substantial anti-immigration legislation in recent months. The new immigration bill would both decrease protections to immigrants already living in Italy and deny asylum to any who are deemed “socially dangerous” – a term left notably ambiguous in the bill. The populist parties now in power were explicit in their intent to work contrary to policies made in Brussels. Over the summer, Salvini made it his mission stop as many boats containing immigrants from landing as possible. One boat containing 58 asylum-seekers was left idling off the waters of Italy for days before a deal was struck with more compliant European nations to accept their entry. Salvini has turned his stance on immigration into a strategic misanthropy in negotiating with the EU, aiming to overhaul the current system so that neighbouring countries are obliged to take in more asylum seekers. In a recent speech in the Bundestag, Merkel declared that the migration challenge could make-or-break the European project. Italy certainly sees this to be true and is doing all it can to exploit the more compliant of its European allies. It is clear that the aim of the new Italian government is to defy the will of the EU, however, to what degree fulfilling this aim will hurt their own interests remains ambiguous. Using immigration as a political pawn, the Italian coalition has incited fear in their voter base, while acting as a thorn in the side of governments pushing greater integration. The proposed budget suggests that Italy’s government is more concerned with short-term political objectives than creating a sustainable economic framework to revitalize Italian wellbeing. Then again, democracy doesn’t have a good track record in its ability to incentivize attention toward a long-term horizon. Italy has joined a broader coalition of European nations, alongside Orban in Hungary and Kaczyński in Poland, who are running against the grain of centrist liberal order in Europe. 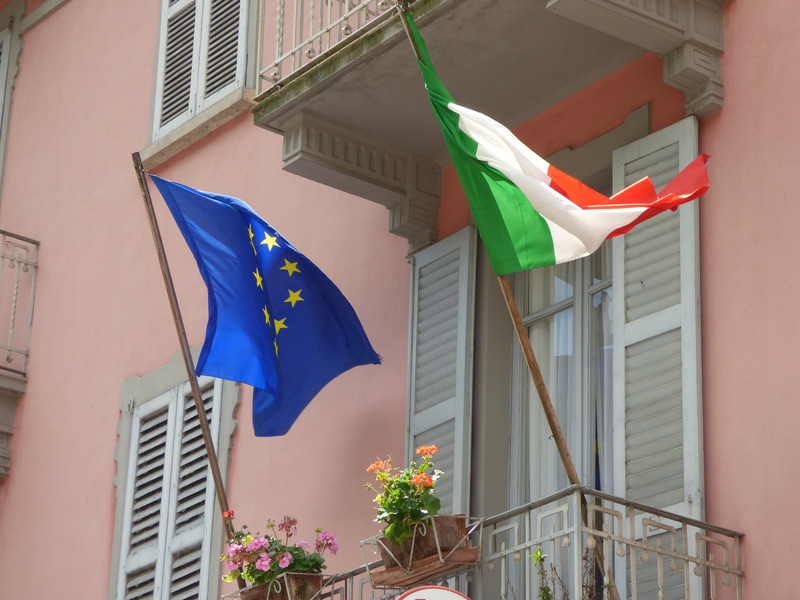 Appeals to nationalist sentiment and eurosceptic frustration have led Italy’s populists this far, but whether they can provide the corrective remedies necessary for these ills is yet to be seen. For Europe, taking this populist reaction seriously means a reconsideration of fiscal unity and financial integration. Until the more deep-seated problems of investment attractiveness and fiscal solidarity are addressed, the European project will be vulnerable to all that democratically-elected populists throw at them. Feature image by Elliot Brown, via Flickr Creative Commons.